Membership of the Club is open to anyone aged 16 years and over, non-artists, beginners, amateurs and professional artists alike. For an additional annual fee and subject to availability, members can join a studio group. They run through the winter, spring and autumn time and meet in Turnberries, Bath Road. Studio numbers are restricted to 18 people, the maximum the room can comfortably hold. Workshop Days costs are dependent on tutor fees but are usually in the region of £20 - £34. 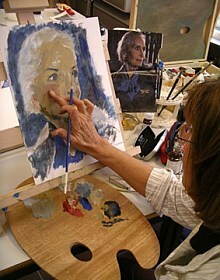 Painting from Life Models can also be arranged, for an additional fee, when sufficient numbers make this viable. 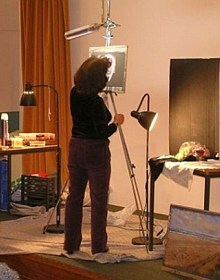 The object of the Club is to encourage and promote visual arts in the Thornbury area by organising activities such as: talks and demonstrations, exhibitions for members to display their work, studio groups for members to develop their skills and share knowledge, workshops for professional tuition of members, visits to exhibitions. To receive a full copy of the Club's Constitution by email please contact the club secretary.